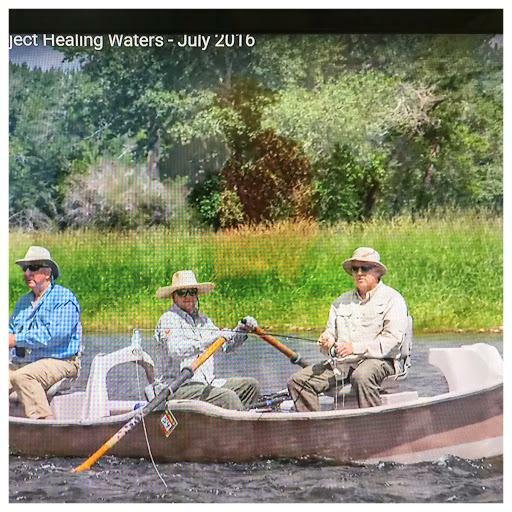 At Healing Waters Lodge we are intimately involved with Project Healing Waters Fly Fishing, Inc., a non-profit organization founded by Retired Navy Captain Ed Nicholson. Below are testimonials from two friends of ours who assisted us last summer at the lodge working with disabled veterans. They also represent the quality and character of the fishermen that come to Healing Waters Lodge. Warren Stern and Bill Stewart are just a few of the clients that have freely given us their time, financial resources and fishing knowledge to serve something greater than them. We are moving into our 14th year of working with Project Healing Waters. I believe in the fishing world, Warren and Bill and their commitment to service are not the exception but the rule. I also believe that the majority of people that have picked a fly rod casting for some invisible force of nature are quietly making contributions to Project Healing Waters Fly Fishing, Inc., Trout Unlimited, The Montana Land Reliance, The Nature Conservancy, Casting for Recovery – in short – they are making a difference. These are my people and I feel damn lucky to be in such good company. Both Warren Stern and Bill Stewart joined us last year for a week at the lodge that we set aside to host a half dozen men and women in uniform. This year we have set aside July 4-9 for Project Healing Waters. We have a few spaces left for sponsors. There is no difference between a sponsor and a paying customer. Everyone fishes, everyone has their own room, everyone has great meals and everyone fishes for a greater good. The physical and psychological harm suffered by many of our veterans is well-known. What are less well-known are the benefits of recreational therapy, including fly fishing. One academic study, for example, found that combat veterans had significant reductions in stress and PTSD (post traumatic stress disorder) symptoms and improvements in sleep quality after participating in a fly fishing retreat. Less important but also significant is the sense of satisfaction that comes with volunteering to help in this effort. Thousands of anglers have volunteered in local and regional Project Healing Waters Fly Fishing Programs. They teach angling skills to participants, including casting, fly fishing, and rod building, and accompany them on fishing trips in fresh and salt waters, including some of the more fabled fisheries in the land. More than 7500 disabled veterans and disabled active military personnel have participated in these programs. This is where Healing Waters Lodge comes in. Several times each season Healing Waters Lodge is available to Project Healing Waters participants and volunteers. I spent a week at the lodge as a volunteer on one trip, and can say that it was more than a fishing trip. Aside from the outstanding hospitality Healing Waters Lodge extends to all of their guests, and aside from the quality of the fishing and the guides in Twin Bridges area, there is the comradeship of men and women who have served our country and were delighted to spend some time enjoying the natural world and the pleasures of a sport that is so much a part of our national tradition. To borrow the advertising slogan, this is “priceless.” Warren Stern – Attorney, Project Healing Waters Volunteer, Fisherman and Part time Visionary. In May, 2016 I was fishing at Healing Waters Lodge with my 24 year-old son. Although Mike Geary was not physically in the boat with us daily, he was “spiritually” fishing along with us. He remained up-to-date daily on our fishing and floating activity, including types of fish caught, “environmental releases”, moose and other wildlife sightings, and other particulars and minutiae of floating the Southwestern Montana Rivers that week. At the beginning of the week, my son insisted on a small wager regarding which one of us would catch the most “quality” fish, and this quickly turned into a wager regarding which one caught the most quantity of fish, as we agreed that all trout are “quality” fish regardless of girth or size. Mike stayed up to speed on the daily tallies for this wager, which I eventually lost – to Mike’s amusement. Toward the end of our week of fishing, Mike asked me if I would be interested in helping him when he and Laura hosted several US Armed Forces combat veterans at HWL later that year through an organization called Project Healing Waters (PHW). Mike has been donating his time, guiding services, food and lodging to PHW veterans for many years, and was enthusiastic about the benefits to the veterans, as well as to those who volunteered to fish with them. My initial reaction was: No, I’m not good enough to be a fishing guide, I am not a veteran with comparable experience to understand their issues, and I have no other qualifications to provide advice or assistance that would benefit these veterans. But Mike explained that all that was required of me was to fish with one veteran each day, and the fishing itself would provide understanding and connection for both the veteran and me. Mike also thought it would be a good idea if the veterans each caught more fish than me, too. I have helped Mike and Laura (and the HWL gang) on two occasions when they opened the Lodge to PHW veterans. Both were weeks that I fished with the veterans from PHW; I talked, laughed, cried and enjoyed myself immensely. I have no doubt that I received a whole lot more knowledge, compassion and grace from the veterans than I could have given them. So now I feel like I need to be a part of this Project Healing Waters not only for the veterans, but for my own self respect and esteem, too. Another example of going fishing and ending up getting hooked myself! Bill Stewart – Project Healing Waters Volunteer, Black Belt in Fly Fishing, Interpreter of Tax Codes and the subterranean world of the IRS. Two years ago the following video, The Legacy Project by Brent Foster, was done at the lodge in conjunction with Project Healing Waters Fly Fishing, Inc. This hopefully will give you a flavor of what we are doing out here. It also in memory of Brian Mancini who recently passed away.